There are a couple of rumors that go around about pediatric rotations. I heard them multiple times, and I've heard them from students in all different programs. The parents are the worst part of working in pediatrics. You will definitely get sick while on this rotation. Unfortunately there is some truth to these rumors. Most of the time parents are fine, but every once in a while, there will be one that is very difficult to deal with, but they weren't that bad. And I definitely got sick because kids don't even try to not cough or sneeze in your face. I felt kind of bad for the last week of my rotation, so after multiple negative strep tests, I went to the student health clinic. Just a mild case of pneumonia, but that was resolved with some steroids and antibiotics. And I learned my lesson and decided I should probably go to the doctor if I'm feeling bad for a week or so and it's not getting any better. My pediatrics rotation was at a small clinic in town. All of the staff and the physician are hispanic, so about half of our patients were mostly Spanish-speaking. I took some Spanish in high school and college, but I am in no sense fluent. I can understand some things and carry on a very basic conversation. So that was a challenge, but I tried! And everyone was really nice and understanding about my lack of ability to communicate. My preceptor was a great teacher. He had been practicing for years, and had seen some tough cases. He liked to pimp me, whether we were in the room with patients or during lunch, and his questions were extremely specific. I rarely knew the answers, but I would always try, and I learned a lot. He was always nice when I didn't know too. We had a document as a class with notes of questions he had asked other students in the past, so I tried to study that, and it helped me to get a few right. There are so many strange congenital defects and diseases that it's impossible to feel prepared to know them all coming out of PA school. We learn the basics. Kids can be tough. If they're sick, then they are already upset and really don't want you messing with them. I think its's hard for them to realize that you just want to help. Some kids will automatically start sobbing when you come in the room. I learned to look for tears because otherwise they are just putting on a show. There are a lot of well checks, along with the sick visits. One of the interesting things I got to see on this rotation was a child with chicken pox, which my preceptor said he hadn't seen in a few years. It was a textbook appearance, but it's become very rare to see it in clinic. The pt was about 2 weeks away from getting her chicken pox vaccine. I also saw a teenager in sickle cell crisis, which seemed to be very painful. He had experienced it before and really needed to be at the ER, but it was still a good thing for me to see. I enjoyed pediatrics, but it was a little exhausting as well. My preceptor would just hold kids down if he really needed to, but he was a big guy, and I'm not. Even now I don't even try to restrain kids while I'm treating them because I usually end up getting kicked or not being able to do what I need to do. In dermatology (at my practice), I do get to see a good bit of kids. I think if that's all I saw, I wouldn't like it as much, but I do like getting to see them occasionally. At my program, we had 8 weeks of internal medicine total and could break it up into 2 separate 4-week rotations. I did one of mine in general IM and the other in endocrinology. My initial thoughts about endo were that I didn't know that much so I needed to do it, and lots of diabetes was in my near future. So what I learned on this rotations is that I was right that I didn't know much and that endocrine does see a lot of diabetes, but there's a bunch of other stuff too. And there's a lot more to diabetes and treatment than we learn about in school. Probably because they have new drugs and insulin more often now. My rotation was about 30 minutes away in a small town, and the office was a really cool old Victorian house (which I later found out was apparently haunted). There was a physician and a PA and I was able to spend time with both of them. The MD at this practice was a little picky about things, and would have a mini breakdown if you happened to forget the patient if they were taking aspirin or another minor detail. I would always remind him that the patient was still there and go ask as promptly as possible. Interesting dynamics in that office. There is a huge lack of endocrinologists right now, and that need is just going to grow as America continues to lack understanding about their health. The patients would come in and have vitals done, occasionally a DEXA bone scan, and then be seen. It's really important that diabetes patients keep a good record of their blood sugars, meals, and medications, especially if they are uncontrolled. I would say about half of the patients actually brought these with them, which was a little frustrating. The office I was in would do something called continuous glucose monitoring on patients that were having trouble getting their sugars under control. Basically they wear a monitor for 3 days that takes periodic measurements of their blood sugar and then provides all kinds of graphs. These can be done from blood glucose monitors too, but take a little more work. If the patient is diligent about recording their meals and medications, that data shows when they may need more or less insulin or what meals they need to adjust. It was really neat. Besides diabetes, there were also a lot of thyroid issues. Whether it was hypothyroid or hyperthyroid or thyroid nodules or masses. The MD had an ultrasound that he would do on patient's thyroids and he also performed fine needle aspiration biopsies as well when needed. Those were very neat to see, and similar to what I had seen on my surgery rotation for breast mass biopsies. I went into this rotation thinking I was going to hate it, but I actually ended up liking it a lot. In fact, I think if I wasn't working in dermatology, I would have looked for a job in endocrinology. My husband is a 4th year medical student applying to internal medicine residencies right now, and I secretly hope he ends up doing an endocrine fellowship so I can work with him some. I considered endocrine "lab medicine," and while labs are important, it's also important to talk to the patients and educate them on their disease state. Unfortunately, I never saw the ghost of the little girl that had been seen multiple times in the office, but that's probably for the better. I think doing this rotation helped me on boards a ton, and gave me a much better understanding of diabetes medications and interpreting thyroid labs, so I would definitely recommend doing one if you can! Going into my Emergency Medicine rotation, I was a little apprehensive. I mean, anything can walk through those doors right? At this point about halfway through my clinical year, I wasn't really thinking of myself working in the ED. The hospital I was working at was a smaller one, where there are usually 2-3 physicians and 2-3 PAs or NPs on at any given time. My preceptor was great! He loved to teach, and if we had any downtime, he would try to fit in a quick lesson about one of the many essential topics in the ER. Everyone at that hospital was so nice and helpful. I was the only student there and if anything interesting came in, the nurses or physicians or PAs would always come and get me. Basically the way the ER works is that a patient comes and signs in and they are triaged. Their name and chief complaint are displayed on the provider's computer, and then each MD or PA decides who they are going to pick up. It's important to keep a good balance of straight forward cases (like a cut that needs sutured) with more complicated cases that will require labs or imaging. Since I was there, my preceptor would usually pick up 2 cases at a time and I would go see one patient while he saw the other. I was definitely right in assuming that the ED is unpredictable. There would be some days that we were sitting around with not much to do, and then other days that there were so many patients, they were being treated in the waiting room. Literally, one of the PAs would go in the waiting room, and if there was something simple they would treat the patient there. Since the shifts are usually 12 hours, there would often be busy times and slow times during the same shift. I ended up staying late a few times, just because it had gotten so crazy by the time I was supposed to leave. Suturing a cut from a chainsaw - I did this all by myself! My preceptor said he would come check on me, but I finished before he had the chance. I had a little suturing practice from my surgery rotation, but those were cleaner cuts. My patient was really nice, and I remember his son was there and they were watching a show about puppies on the Animal Planet, which didn't seem quite characteristic, but was funny. Remove a fishing hook from a pt's neck - Definitely interesting. I just used a pair of pliers that look like they came from my dad's toolbox. The pt did great though! See CPR - I didn't actually participate because by the time the pt got to the ER, the respiratory team was bagging the pt and they had the LUCAS machine on that does chest compression. Pretty crazy to watch. Staple a child's head - Not the most fun, but good practice for working on kids. You just have to be fast and hold them as still as possible. Drain a cyst - This was good practice for my current job in derm. I still hate draining cysts. The smell is just too much. Set a broken radius- I don't do well with bones. Like those videos with people breaking their arms and legs? I just can't handle them. So when an 8 year old has a broken arm and they asked me to set it, I said sure just like any good student would do. And then I almost passed out. Whoops. The feeling and sound and the MD "recreating the injury" to then put it back into place after I failed, that just didn't work for me. So I turned sheet white and started blacking out as I ran out of the room to find a place to sit down. I got made fun of just a little bit for that one. Watch a dislocated hip be realigned - More bones. This was after the arm, and once the MD was standing on the bed and pulling on the patient's leg, I just decided to look at the ground. But I heard it go back into place! Pop a dislocated shoulder back into place - For some reason I handled this ok. It wasn't that bad. Basically you pull down on the patient's arm, and then rotate their arm backwards and up and it slides back into place. So by the end of my ER rotation, besides the bone stuff, I really felt like I would enjoy working in that field. I really liked the hospital I was at, and it would be a wonderful place to work. Of course, in the ED, you get some drug seekers and difficult patients, or patients who really should just be at prompt care, but what can you do? All of that is really just a part of medicine, so we deal with it. The one thing I didn't love about the ER was the long shifts. I felt like I went to work, came home, ate, slept, and then did it again for 3-4 days in a row. So it was pretty exhausting, but I think it would be something you get used to if you do it all the time. Here is a blog post with an interview with an ER PA. And another one as well. "Advice to New Interns" - or to new PA students on rotations. Here is a blog post from a fellow student about her experience and tips for an ER rotation. One of the fun parts of clinical year is getting to choose where you will do electives, but this can be stressful as well. There are a lot of different things to take into consideration when trying to figure out where you want to spend your extra time and various strategies for making those decisions. Is there an area that you weren't able to rotate in that you think might interest you? Electives are a great opportunity to explore your options and find out if you would like a job on a daily basis without committing to a contract. For example, my school doesn't require an orthopedics rotation, but it's a very popular area for PA students (and a good chunk of the PANCE) so a lot of my classmates chose to rotate through ortho. Even if you don't love the exact area that you choose to rotate through, it may give you some direction. Was there a rotation that you loved, but not sure if you would want to do it daily? Maybe you just need more time to figure it out, and you can use that elective to find out. If you liked a specialty, but spent most of your time in a hospital setting, you could try to find an outpatient office to get some experience in a different setting. There can be a huge difference in working in a private office and working in a hospital. I was on the inpatient wards for my whole psychiatry rotation, and I hated it, but some of my classmates had great experiences in outpatient psych. Is there an area that you feel like you are not as proficient at or really worried about for boards? For me, it was cardiology. I still wish I had the opportunity to do a rotation specifically in cardio because it's such an important part of boards and seeing patients in multiple areas. I chose to do a general internal medicine and endocrinology (which I would recommend for sure) instead, but I think cardio or pulmonology would have been really useful. Doing an elective in an area that you don't feel as comfortable in will help you to step outside of your comfort zone, and help you to feel more ready for boards. Is there a specific area you are interested in working in? If you already have an area of interest, but have not found a prospective job yet, you may try to do a rotation in that area. It's always a good idea to make your interests known so that potential employers or preceptors who have connections can help you to find a position. By doing electives in an area you want to work in, it will give you extra experience, which is a plus when applying for jobs in that area. Do you have a prospective job opportunity? If someone has made you an offer of employment or is possibly considering that, you may want to do one or all of your electives with that group. It gives you a chance to see if you would fit in and feel comfortable, and it gives them a few months of free training, which means you'll be working on your own sooner potentially. Personally, I knew I wanted to work in dermatology if possible, and I was able to use my 2 months of electives as a benefit during my interview. I was hired before my electives and that time was great for training, and I was able to start seeing patients on my own about 1 month after I was officially licensed because I had 3 full months of training done already. If you already know what area you will be working in, is there a different specialty that would make you a better provider in your field? Many fields have a lot of overlap, or you may end up sending patients out to a specific specialty, so it wouldn't hurt if you are able to spend some time in an area that is complementary to your field. In derm, we send patients to Rheumatology a lot for example, and Mohs surgeons as well since we don't do that at the practice I'm at. If you're going to be working in primary care, I think extra time in any specialty is helpful, but consider derm, endocrine, or ER. If you're planning on working in an ER, I think a derm or surgery rotation where you'll be able to really work on suturing is a good idea. Do you feel like you need more study time for PANCE, but still want to take it early? Some rotations are more laid back and less time consuming than others, which would give you more time to study. ER is one that typically you have to do a set number of shifts so if you have flexibility to do them all at the beginning, you would potentially finish a rotation early and have extra study time. Is there a different city or state you are possibly interested in working there? Elective rotations are a great opportunity to explore other areas of your state or maybe another part of the country. A classmate of mine did rotations in Texas, Tennessee, Wisconsin, Washington, and Alaska, where she is now currently working. If you have the financial means and the flexibility to travel, then go for it. Doing rotations in other geographic areas will also help expose you to how healthcare is different among regions. Let me know in the comments if there are any electives you would or would not recommend and your tips for how to choose those rotations! This was my first surgical rotation, and I don't think I realized how much surgery is involved in OBGYN until I was there. I have to admit I was not excited going into this rotation. I had never done a Pap smear up until this point, and I was thinking I would be just fine if I never did. Nonetheless, it is an important skill that I did get some practice with. Anyways, I showed up on the first day and met my preceptor and her medical assistant. They were so much fun to work with, always saying hilarious things, even if they were sometimes slightly inappropriate. My preceptor was from Europe, so she was raised with a different medical model, and she has extremely strong opinions about our government. That made for some interesting discussions, and I did learn a good bit about politics so I could keep up with her jabs at political figures. She was really fun to work with, and a very patient preceptor. She would ask me questions, but was never rude or condescending towards me (or any of the staff for that matter.) I really respected how laid back she was, and I honestly don't think I ever saw her stress out about being behind or having to run back and forth from the office to the hospital. They told me to meet at the hospital at 6 am for my second day to go into the operating room. I was so nervous. My biggest fear was passing out when the surgeon made their first cut. While shadowing in dermatology, I had a close call when I saw a punch biopsy, and that's nothing. I mean, I actually do those myself now, which is especially silly to think back on. When I saw the PA cut into the patient, for some reason my face turned white and I started blacking out. Luckily, the PA looked over at me and asked if I wanted to sit down, which was a great idea. So needless to say, I didn't really want to make a fool of myself at the beginning of my rotation. I showed up at the hospital to watch a laparoscopic tubal ligation and an abdominal hysterectomy. During laparoscopic surgery, you watch the monitor more than anything else. Hysterectomies can also be done laparoscopically in some cases, but this one wasn't. As they started to do the transverse abdominal incision, my nerves melted away, and I was intrigued by getting to see all of the organs I had been learning about in a real person. This is where having a cadaver lab in anatomy really became helpful. Although cadavers don't have the same fluids that a live body has, I had already felt the difference in an artery and a nerve, and when there are a bunch of fluids, it can become hard to differentiate. That was a fun day, and really started my love for surgery. You can visibly see the baby moving, and it's kinda freaky. Try not to make weird faces because the baby daddy might call you out, and that's embarrassing. If you are more in shape/fit/healthy before you get pregnant, you will likely have an easier pregnancy, less weight gain, easier time losing the baby weight. If you are more unhealthy, you will likely be more miserable. Pregnancy is different for everyone! Here's hoping when that time comes, I get the easy kind. Pregnant women seem to be doing great, but at a certain point, they're all ready to not be pregnant anymore. And those last vaginal exams seem to be really painful. If you've never been pregnant, an OBGYN rotation can freak you out and prepare you way too much for what's to come. My rotation was in October, and I'm not sure what holiday happens 9 months before then (New Year's maybe? ), but there were SO many births while I was there. I assisted in 9 C-sections, and saw 5 vaginal births. My classmate who rotated in February had no births with the same preceptor, so it's really hit or miss with what you'll actually get to see. Cesarean sections (C-sections) are really interesting surgeries. The patient is awake for one thing. Basically an incision is made through the skin, and then the fascia, and then you can see the uterus! We had one patient who was on her 4th C-section, and she was a very high risk pregnancy. When we got to her uterus, it was about as thick as plastic wrap, and you could see through it like plastic wrap! Once the uterus is opened, there's a whole lot of fluid that's released. Births are extremely messy. It is really cool getting to see the baby delivered and how excited the parents are. Vaginal births are also interesting, but honestly neither option looks quite natural. I wish I had seen a multiples birth while I was there, but I got to see plenty of single births. On my longest day there, I arrived at 6 am and didn't go home until midnight. We had 3 women in labor at the same time by the time we were done with clinic patients. 2 were first time mothers, and the other was having her third child. It was definitely worth staying around, but I was exhausted by the time I made it home that night. One interesting case I saw was a woman who had a procedure done for abnormal cells on her cervix. She called the office because she had started bleeding about a week after the operation. She came in and was extremely pale, and she was bleeding through at least one pad each hour. That's too much blood loss. We ended up having to go back to the OR to stop the bleeding, but it was pretty scary seeing her so unstable. I ended up actually really enjoying my time in OBGYN. I liked the OB part of this specialty much more than the GYN part. There are some residencies available if this is a field that you are really interested in. Unfortunately, in Georgia, PAs are not able to deliver babies. We actually had a PA who had done a residency in California come talk to our class, and although she had done over 500 deliveries, she still wasn't given clearance to deliver in Georgia. If you are into the OB part of things, you may want to look into state laws before doing a residency. 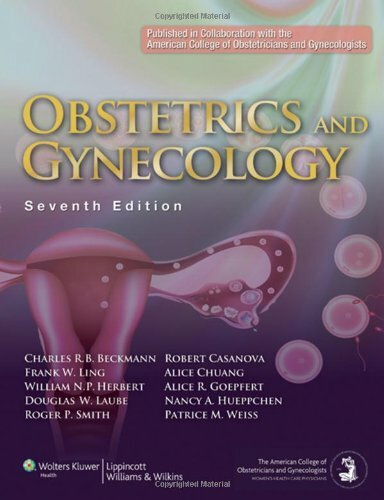 The main book I used to study for this residency was Beckmann's Obstetrics and Gynecology. It's very easy to read and very thorough. I think I felt most prepared for the OB/GYN end of rotation exam out of all of the exams. I would love to hear about some of your experiences in OB/GYN or answer any questions you have so feel free to leave a comment below! So I'm going to be honest. Psych was not my favorite rotation. Actually, it was my least favorite, and I'll tell you why, but this was definitely the rotation that I most dreaded going to everyday. I spent all 4 weeks of my rotation on the in-patient psych ward at the hospital, and a whole month was way too long to just be in the locked unit. Patients in the hospital are sometimes there for an extremely long time, and so there were a couple of patients that I followed the whole time without many changes, and I just don't feel like I got the best exposure to psychiatry. That influenced my opinion of the field a lot, and I wish I had some outpatient experience mixed in as well. Even the med students only spend 2 weeks on in-patient at a time, and spend other time in outpatient, pediatrics, or the ER. Anyways, enough of my rant, now on to the details of my time in psychiatry. It was a little nerve-wracking going into a unit of the hospital with 2 locked doors that required codes, but it's necessary for the safety of the patients. I spent a lot of time in the resident's room, and I spent a lot of time during this rotation on the phone. This was my first rotation where I was working with med students and residents. The med students that were there only stayed for my first week, but they were so helpful! This was my first rotation using electronic medical records (EMR) since my family medicine rotation was still using paper charts, and the med guys showed me the ropes and were a big help to me. Residents were a different story. The first resident I was assigned to was actually a PA for about 12 years before deciding to go to medical school, and she was a little frustrating at times and would give me pointless things to do, like finding colleges for her daughter to apply to. Not super beneficial for my education. But as bad as I though she was, it was nothing compared to the resident I was with for the last week. She was extremely unreasonable and not helpful at all, so that was a challenge, and I was glad to be done! I met some very nice residents, but I did not get to work with them personally. My attending on psych was great. He was very patient and a good teacher. What's interesting about doing a rotation at a teaching hospital is that the attending is not around very much. We would arrive around 7-7:30 am and go see our assigned patients and then the doctor would show up to round at 9. Rounds on psych were also a little different. We would sit in a big conference room (attending, residents, students, social worker) and bring the patients in one at a time to discuss how they were doing, any changes that needed to be made in medications, and possible discharge plans. After rounds, we would put the plans into action, and like I said above, that typically meant a lot of phone calls. There has to be a lot of communication with family members if considering discharge to ensure the patient will be safe and have support to continue medications and make it to follow up appointments. One of the hardest parts of psychiatry is establishing discharge because the patient has to have somewhere to go. If they do not have a home or anyone willing to take them in, then the social workers try to find a shelter or halfway home for them to go to. I saw some extremely interesting, and very sad, cases while on psychiatry. I think for me personally it was just too emotionally draining. There was one weekend that I felt very depressed and I think it was just the environment that I was surrounded by. The second day I was there, a patient actually committed suicide and that was extremely troubling to all of us there including providers, students, and patients. There are measures in place to prevent something like that from happening, but if a person is determined enough they will find a way. There was a lot of procedure to go through after that and a patient limit was started on the unit, which decreased the amount of patients we got to care for. There was an 18 year old who had been started on antidepressants before leaving for college, and 2 weeks into school called her parents with serious thoughts of hurting her roommate. That progressed to thoughts of hurting other people, including her family and herself, and she ended up on the in-patient unit. The new medication and stress of starting school had basically initiated a psychotic break. She was experiencing very intense hallucinations. For example, at one point the medical student and I were questioning her, and he asked if she was having any violent thoughts. Her response was that she was imagining taking the pen out of his shirt pocket and stabbing him in the throat. That was sobering and made me realize this was a serious place to be and it really broke my heart to see such a young, pretty girl struggling so much. She was very sensitive to medications and one of the medications she was started on actually caused her to have tardive dyskinesia. It was also interesting seeing how patients can work the system. There was an Asberger's patient who treated his time in the ward as a vacation. He found out that if he said he was suicidal, they would have to admit him and then he would keep saying it while he was there. Patients would also occasionally come in if they needed a place to hide out, like if they owed someone money. The attendings were good at recognizing these patients and finding out their motive. I also got to see great cases of schizophrenia and bipolar disorder, as well as drug and alcohol abuse. I did learn a lot, and one of the good things about psych is that the test was very straight forward. I feel like psych is easier to learn than some other areas. The hardest part is the medications for sure! 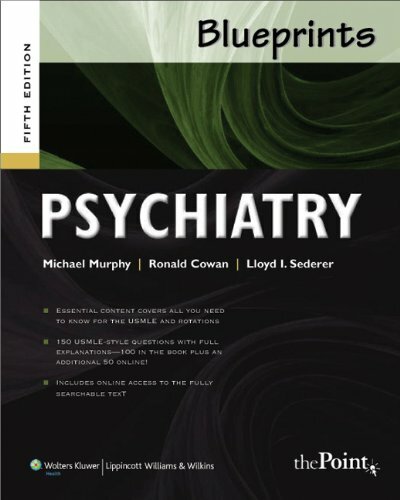 The book I used the most was Blueprints Psychiatry, and I would recommend doing as many practice questions as possible. My frustrations with psychiatry came from only seeing in-patient and feeling so limited by medications. Some of the patients were on so much medicine, and it was very hard for me to see the effectiveness in the time I was there. At least one person that I graduated with is working in psychiatry and I think it takes a very strong personality and someone who does not let their emotions get involved to work in this field. I would love to hear about some of your experiences in psychiatry or answer any questions you may have! Here is a blog post of another student's experiences while on her psych rotation. I started my clinical year in Family Medicine, and personally it was a great place to start for me. I was at a private practice with one physician who has been practicing for years in the area. He's getting close to retirement, so he only sees patients in the mornings each day from about 8-12. I was a little worried at first that I wouldn't see enough patients to feel like I was getting good experience, but that was not the case at all. We would usually see 12-15 patients each day and I think I had plenty of exposure to family medicine during my 4 weeks there. My first day there I was a bundle of nerves for multiple reasons. I was going into a new place where I didn't know a soul and it was my very first rotation. I walked in and the sweet nurses told me where to put my stuff and then I went to meet the doctor in his office. He was very nice, but had a somewhat flat affect and not much to say starting out. I still didn't have any idea what to expect or what he would actually want me to do. When patients started showing up, I was thrown to the wolves, which ended up being a good thing. I would go to see the patient first and then come back and present to him. He would ask me questions, which made me think about things I should be asking and considering. Yearly well-checks/physicals - There is a lot of counseling done at these appointments and reviewing diet, social habits, medications, vital signs, and just basically a good check-up. This is a great time to practice the physical exam. Some preceptors may do a modified PE, but if you have the time, practice your skills. Hypertension (high blood pressure) - If the nurse checks the BP and it's high, you should recheck it manually in the room and possibly in both arms before reporting to the physician because they will most likely ask you to do this. Hyperlipidemia (high cholesterol) - If a patient ate a fatty meal the day before they had labs drawn that is not the reason their cholesterol is high....maybe triglycerides, but still. Diabetes - This is tough, and can be very difficult to control. There's a lot of counseling involved in diabetes treatment, and if you have the chance to do a rotation in endocrinology, I would definitely recommend it. Uncontrolled diabetes can lead to some scary stuff. Shingles/Herpes Zoster - This one is so easy to miss when it presents early, and I know that from experience. And it still tricks me sometimes! The biggest clue is if it only appears on one side of the body. So if a patient is having symptoms (tingling, itching, pain) or even a slight rash and you feel like it follows a single unilateral dermatome, then you should at least consider shingles. I had my first encounter with a drug seeker/addict on my first rotation as well, and I felt like the most naïve person alive when I reported by my preceptor. He had known the girl for years, so he had expectations that were different than mine. She gave me a really intense story about how her life had been crazy lately and she really could use some help with anxiety, and she has a lot of trouble paying attention at work, and she has to stand a lot so she has a lot of back pain. I told the physician about all of her ailments, and his response was, "Ah, the trifecta." I came to learn that people will frequently want not only pain medication, but also medications for anxiety and ADHD as well. These substances are so commonly abused by patients and by providers prescribing them incorrectly that you have to be a little skeptical of patient's intentions, which is sad but also the real world. I had one very scary experience while I was on this rotation with a diabetic patient. I knew he was somewhat uncontrolled going into the room, but at first glance this patient was flushed and just didn't look good. I started questioning him, and he had been having diarrhea for about 2 weeks. A change in fluids or intake/outtake in a diabetic patient is a dangerous thing. He was on insulin, and his blood sugar was reading in the 300 range consistently. He was basically going into a diabetic coma (hyperosmolar hyperglycemic syndrome) and needed to be at the ER, but was at our office. I left the room to grab the doctor and we heard a loud noise, which was the patient basically passing out and falling back on the table. That could have been really bad, and led to one of the lessons I share below. We called an ambulance to help him get some fluids, but that was a learning experience for sure. Be skeptical. It stinks, but there are some patients that may try to take advantage of you, so just be careful. If you get to present, go for it. Go ahead and say your differential and what you would like to treat with. The physician is likely going to ask you about this anyways, so no harm in just presenting it from the start. Never leave a patient's room if you think they may not be stable, like I learned from my diabetic patient. Don't laugh at what patients say no matter how hard it is at times. People will say some of the craziest stuff and pronounce things a little funny sometimes, so try to stay neutral if possible. Like "asmur" (asthma) and "diabeetus" (diabetes). Work on your shocked face. I'm really bad about showing all of my reactions on my face. This is still something I struggle with at times, but I've gotten a lot better. Whether it's a baby moving in a mom's belly (that can be strange) or a 4 cm skin cancer that is bleeding like crazy and has been there for 5 years, it's best just to smile. As far as resources, since this was my first rotation, I was just trying to figure out what the best book might be. I ended up using my PANCE review book (which every PA student must own) a good bit, but sometimes it just didn't have as much specific information as I was looking for. 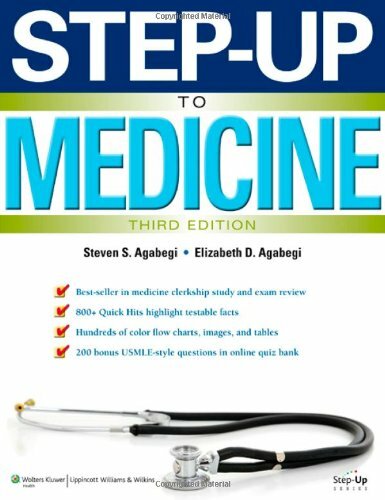 I ended up also using Step Up to Medicine as well, and I really like this book for both family medicine and Internal medicine. Overall, I really liked family medicine. I love that you get to know your patients so well and follow them closely over time. The one thing I didn't like was seeing "sick" patients like ones who have the flu or colds. I didn't see as much of this here because it was August though. I would love to hear your thought or questions about family medicine! So once you've successfully completed your didactic year of PA school, it's time for the clinical year. This is an exciting time because you finally get to put your knowledge and skills to the test and it's so much easier to remember a disease or medication when you see it in practice. Most PA programs try to incorporate some clinical time during the didactic year, but after that it's no more classroom time, which is awesome and scary! Here are some of my tips for making the most of your clinical year. Be confident. You've worked hard to get to this point, and although you might not feel ready to see real patients, you are likely more prepared than you think. So trust yourself, and trust that the answer you're unsure about might just be right! Or it could be wrong, but there's no harm in getting an answer wrong and you'll at least learn something in the process. I got plenty of answers wrong when being "pimped" (this means quizzed) by preceptors, and there were times I didn't answer out of fear of being wrong and I would have gotten it right! Be honest. When your preceptor asks you a question, whether about yourself or what field you want to work in, just give them a real answer. I thought at first I should tell all of my preceptors that I wanted to work in their specialty so they would give me a job, but that didn't work. What did work, was when I started saying I would actually like to work in Dermatology or Surgery, and then my preceptors helped to use their connections and that's how I ended up with my job. Ask questions. If there's something you don't understand, then ask about it. As a student in a new setting, it can sometimes feel like you're in the way so you try to be invisible. Most preceptors are not getting paid to spend time with you, and even though some will try to use you like free labor, a lot of the physicians and PAs love to teach and want to pass their knowledge to you. The only problem is they may have been practicing so long that they assume you know things that you may not. This is your education, so get the most out of it by asking the experts while you have access to them as a student. Be helpful. Having a student can slow physicians down at times, so try to be helpful when you can. Whether that's going to get printed prescriptions, doing tasks that you think are pointless (like making copies for the psych resident, but that's another story), or setting up for a procedure. Try to think ahead and do anything that the nurse or MA might do if they are not around to do it. Sometimes PA or med students feel these tasks are beneath them, but really it makes you look good to show that you are willing to do some grunt work. Be nice to everyone. You are a guest and need to keep that in mind. Whether its the nurse or the front office staff or the drug reps, kindness goes a long way, and you'll likely need their help at some point during your rotation. This goes for other students you may be on rotations with as well. You don't want the reputation of someone who isn't supportive of their colleagues, or the "gunner" (someone who goes out of their way on rotations to show off or look better than someone else). Be professional. This should be common sense, but no matter how close you get with staff or other students on a rotation, stay professional. As in don't bad mouth the doctor or staff ever, dress appropriately, be on time, and don't complain. Know your boundaries. As rotations go on, towards the end you'll feel more comfortable with what you're doing, but keep in mind that you are still a student. Sometimes preceptors will forget this or not take it into account as they should. Just be sure not to do anything that could get you into trouble. On my internal medicine rotation, it became very common for the preceptors to tell me the patient could leave after I gave my report and potential plan, which is not appropriate by the way. I would have to say, I really think you need to see the patient and confirm my plans or diagnosis. So don't be afraid to say no if there's something you don't feel you should be doing or if you don't feel you're getting adequate supervision. And if you are ever put in a situation where you're asked to do something inappropriate for your skill level, tell your clinical directot so they will know the practices that are in place. Be bold. Again, you are there to learn, so if there's a chance for you to do a procedure or take a history and do a physical, go for it! As long as you feel comfortable(see #7 above) and are capable, take every opportunity given to you. And as long as you have someone supervising and guiding you, there's no reason to pass on a chance to learn a new skill. Keep PANCE in mind. So once clinicals are done, there's boards. And if you thought the first year of PA school went by fast, then the clinical year will fly by. As you study for end of rotation exams, really think of it as practice for boards, and use this to focus your studying. I hope these help to get your mindset ready for your clinical year, and congrats on making it this far! You're on the homestretch! 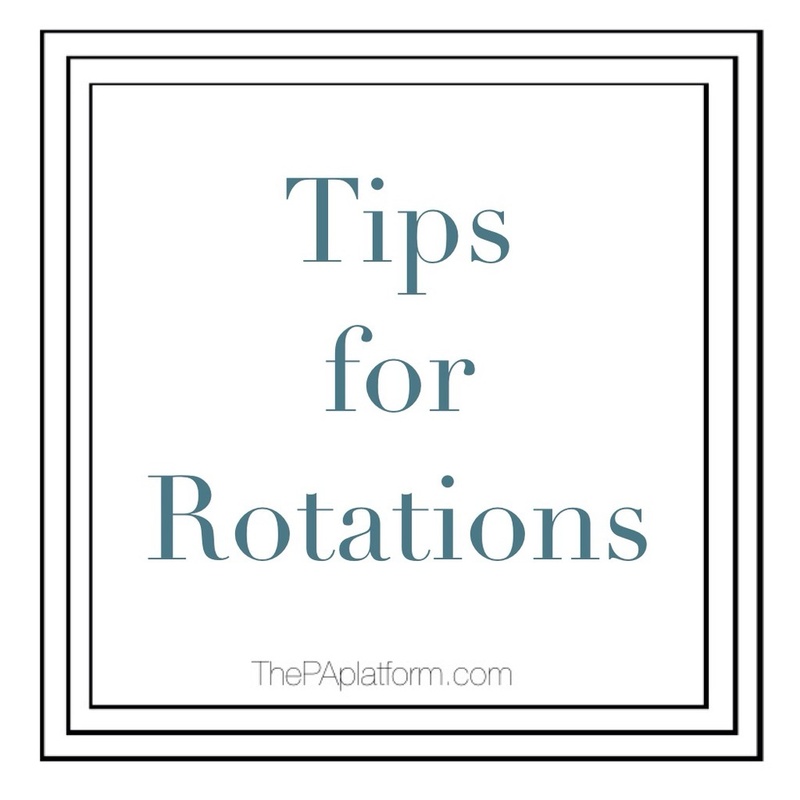 I'm going to start doing some specific articles on different rotations during clinical year, so if there are any specific questions you have please leave a comment! Here is a blog that has some posts about a student's experience while she was on rotations. And here is a different blog with tips gathered from 2nd year students.